Amazon CEO Jeff Bezos has defended his company’s bids for US military contracts. “This is a great country and it does need to be defended,” he said at a conference on Monday. His remarks are an implicit rebuke of Google, which has recently dropped out of the running for the $US10 billion JEDI defence contract, saying that it could conflict with its corporate values. 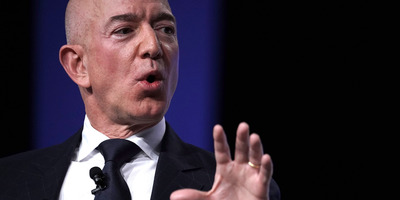 Amazon CEO Jeff Bezos has defended his company’s work with the American military, saying “this is a great country and it does need to be defended” – an implicit rebuke of Google over its decision to ditch US military contracts. Speaking at the Wired 25 conference in San Francisco, California on Monday, the online retail giant’s chief exec strongly spoke out in support of the technology industry’s work for the American military even as some companies reconsider their stance on the practice. “If big tech companies are going to turn their back on the US Department of Defence, this country is going to be in trouble,” he said. The technology industry has been wrestling with its conscience in recent months as workers become increasingly politically active. Google employees revolted over a contract it held to analyse aerial drone imagery (Project Maven), leading the company to decide not to renew it. And a recent Medium post, purportedly by anonymous Microsoft employees, opposes the company’s bid for a $US10 billion Pentagon “JEDI” cloud computing contract, which Google has already opted not to bid for. Amazon is also bidding for the JEDI contract – and unlike some of the other tech giants, it has no intention of backing out. When asked about the actions taken by Google and others, Bezos did not mention the rival company by name – but his remarks can be seen as a criticism of the company. He added: “I like this country … know everybody is very conflicted about the current politics in this country and so on – this country is a gem. And it’s amazing. It’s the best place in the world. It’s the place where people want to come. There aren’t other countries where everyone is trying to get in. I’d let them in if it were up to me. I like them. I want all of them in.